Here's another item from The Burning Crusade. Remember that all herbs from Outland are valuable, so when circling around picking flowers, don't stick to just this herb! 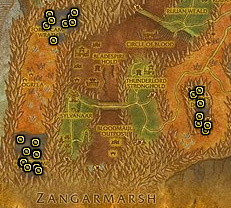 There's gold to be made even if you run into Felweed instead, which is the lowest level Outland herb. Nightmare Vine grows on fel-tainted ground only. Where there's demons, there's Nightmare Vine! Easy gold, especially for a Druid! If you don't yet have a herbalism toon, create a druid or have your current druid learn it instead. It saves a ton of time! In case you're new to wow, Druids can pick up flowers without having to leave their flight form. Not only does it save you from having to mount and dismount at every node, you can also avoid nearby monsters completely as a Druid! Nightmare Vines are required for many potions and elixirs, so there will always be people interested to buy these. 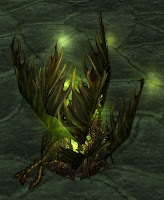 However, even on large realms there's rarely anyone selling these, as they are the main herb in only one zone, Shadowmoon Valley. This means their price is yours to decide. I usually sell them for 15-25 gold each in small stacks and they sell within 48 hours every time if I'm not undercut. If I list any full stacks, I usually list them for a bit less to make them look more appealing. There's really no options on where to farm Nightmare Vines if you want to get lots of them fast. 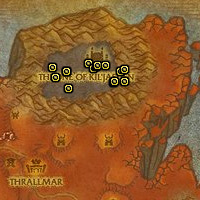 There's 2 areas in 2 zones that have a couple of nodes and one zone that is full of them. The 2 small areas do not have instant respawn nodes, so you have to wait many minutes to see respawning nodes. I'm not sure about the exact respawn time. The zone is full of them! Nightmare Vines are always valuable!